After Brexit, and the weird fissures of Empire Loyalism it has laid open, not only is the sense of a unified coherent ‘Britain’ now just laughable, but the idea of a unified coherent British ‘people’ is implausible. So the constant evocation of “the people” as a force is an immeasurably stupid one. But increasingly “the People” are held aloft as a talisman, a mythical force which must be obeyed. It’s an idea that’s evoked by some of the most deceitful elite forces that have been working in a clandestine fashion for several years now, and all in the name of democracy. And whilst Cambridge Analytica, Aaron Banks and Richard Cook & Co smoothed the deal with cash and data, another element emerged in the zeitgeist of populism and protest. From “Crush the Saboteurs” to “Enemies of the People” a darker undercurrent of threat has bubbled away. Most recently witnessed in the harassing of Owen Jones and Anna Soubry, the threat of violence has been a constant presence since 2016. From Thomas Mair to Thomas Robinson the threat of a new English fascism, with violence at its core has become visible for the first time. It veers from the genuinely threatening far-right of the EDL and its cultivated Islamophobia to the bores of aging UKIP pub-racists. But both are sanctioned and emboldened by the mainstreaming of views that only a few years ago would have been unthinkable. Whilst the image of Nigel on the front lines is fun, the forces he has unleashed are less humorous. 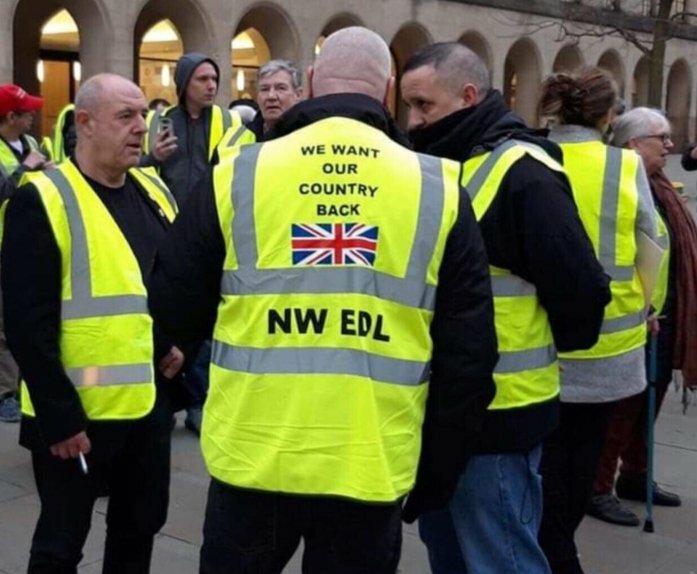 A new element are the Brit versions of the Gilets Jaunes – badly translated across the Channel – Neon Fascists you could say. But given the flag emblazoned on the North West EDL’s back, I think its safe to say that the country he wants back is confusingly Britain, not England. If Brexit looks like Trumpism it’s because Make America Great Again has an echo in Make England Great Again. If England mirrors America it is because both have re-imagined themselves as countries threatened with (imminent) invasion. At the beginning of the year the Home Secretary deemed it a national crisis after five small boats carrying just 40 desperate people attempted to cross the Channel on Christmas Day. Trump imagines hordes of rapists and terrorists massing at his southern border and implores his followers with a celebration of medieval practices. Now Take Back Control has gone the same way as Drain the Swamp, with the Tory Desmond Swayne mirroring Trumps Govt Shutdown with a call to suspend parliament. Brexiteer Conservative MP Desmond Swayne calls on Theresa May to suspend parliament until April in order to "guarantee Brexit." How is any of this possible? One theory is that Brexit has just surfaced complex issues of cultural insecurity that have lain below the surface for many years. It’s fitting that the only person to make any sense of the unfolding crisis is Irish. So there’s a strange logic lurking deep down somewhere here. Brexiteer’s contempt for both Scotland and Ireland – what Adam Boulton called famously ‘England’s fringe nations’ makes sense, if you consider England to be an oppressed nation, held down by a combination of EU bureaucrats, hapless immigrants and recalcitrant Jocks / Paddies (delete as applicable). As we face Theresa May’s moment of crisis the cultural insanity of this may hit home. But as England mirrors America, Scotland should do well not to mirror England. Grievance culture and paranoia should be replaced with the confidence of a normal European democracy with natural resources and talented people. It’s well worth reading the longer version of Fintan’s piece. To summarise, Brexit is not merely an English problem it’s an Englishness problem. For my money an essential guide to ours ( and Trump’s ) crisis is Antony Barnett’s The Lure of Greatness; comprehnsive, nuanced , insightful and deserving of more attention than it has so far been given. The cult of heroic failure is a trope of all extreme forms nationalism surely? (https://en.wikipedia.org/wiki/Siege_of_Baler) the “glorious defeat” has long been a classic of the Spanish right-wing. The Scots, fortunately, only indulge in it at sport really, the fitba especially. I don’t see anything particularly English about it. It’s just extreme nationalism. Maybe. I think the point being made is that this is being evoked in this circumstance to flip the framing of England from colonial power to aggrieved oppressed nation. I get it, there is some truth in it I’m sure, the former great power never coming to terms with its new status. That’s what Germany was like in the interwar years. The Germans also blamed somebody for their much reduced status after 1918, mainly, but not exclusively, the Jews… in Spain with Franco, they didn’t blame the Jews – there were none, they had already been expelled in 1492 – they blamed Communists , atheists and masons. Franco described his coup and the Civil War as a “crusade”. The truly bizarre aspect of the nostalgia outlook is that the British working class lived in absolute squalor until Clement Atlee won the 1945 General Election. There was no Health Service, no universal pensions, no housing, nothing . In Ken Loach’s THE SPIRIT OF 45, one of the interviewees who grew up in Liverpool tells how he would sleep in a bed with his four siblings, and how the bed was infested with vermin, because the whole building was full of vermin, the bugs lived in the walls of people’s homes. Even just a few generations ago, when Britain – as Johnson and co always say – “had all those pink bits on the map” – people lived in total squalor. It shows how dangerous the media is that people can actually believe that the UK will be better off outside the EU, by aiming to return to the days of Empire abroad, albeit a trade Empire, and total squalor and dire poverty at home. There never was a Golden Age, even at the height of Empire, for ordinary British people, who lived in as much or even worse squalor than their French or German counterparts. The British working class benefited not one single bit from the British Empire. On the contrary, they were treated like slaves of the Empire themselves. I’m afraid I can only see Brexit as another total failure of the Left to articulate the case for progressive politics…. Presumably there was some economic benefit from Empire in munitions, trade, industry, as functionaries and exploiters? Britain is one of the richest countries in the world, because it exploited the resources of the colonies of its Empire from where it shipped back raw materials to the UK for manufacture in Glasgow, Manchester, Liverpool etc. The Scottish proletariat and the workers throughout the Empire had actually a great deal in common, they were brutally exploited and lived short, wretched lives, in order that British capitalists could accrue vast profits which they then invested in more capital, in further means of exploitation and in military conquest. It can hardly be emphasized enough that the East India Company, the chief engine of Empire and colonization, which dates from the reign of Elizabeth of England in the 16th century before the Union with Scotland that is, was a kind of Tony Blair/ New Labour private / public initiative,, and backed by the might of the Royal Navy. The State is an invention of capital and capitalism. Among other things the British Empire can boast, apart from starving a million Irish and three millions Indians , and inventing the concentration camp in South Africa, was getting half of China hooked on opium, so they could make vast profits on the opium trade. Drug addiction? Capitalism and Empire invented that too. The descendants of the 19th century Scottish proletariat, particularly in Glasgow and the west coast of Scotland, what do they feel when they walk down Jamaica street? They certainly shouldn’t feel guilt, because their forbears – my forbears – were almost just as enslaved as the millions of colonial subjects who were so brutally exploited. They should feel pride if anything, because their forbears won us all the rights we have today. What makes me despair is that the Labour Party has totally failed in its duty to inform and educate people about where their rights actually come from, and what the history of the Labour movement is. That’s why Ken Loach is important I think. Mike Leigh too. And Paul Laverty of course. Who ever put up on a screen, a history of the Scottish working class? You know, like, three generations of a family? Or the story of the Radical Movement? Or simply a film about how the Labour Pary was formed, how it grew…and what happened when those complete charlatans Blair, Brown and Mandelson got their hands on it and turned it into a travesty of what it was? And that’s why you need the State to put up money for film. Otherwise you only get the costume dramas and endless, tedious story of monarchy and aristocracy. Compare, Bella, how many films and TV shows have been made about Churchill with how many films have been made about Keir Hardy, or John MacLean? Or the aristocracy and the working class? Or great women and great men? Or the completely invisible presence of Black Britain on the screen, the history of black people in Britain I mean? The point about England, and the reason Marx chose it to study, is that it is the first fully-fledged modern capitalist State in the whole of human history. So it is a fascinating case. And it cannot be insignificant that the modern English State is founded and takes on its form at the same time as it embarks on Empire. Henry VII’s daughter sets up the East India Company. And equally, it cannot be insignificant that the Scottish bourgeoisie enters into Union with England, specifically to gain access to the Empire. Without that incentive, there would never, ever, have been a Union between Scotland and England. No chance. The very existence of Scotland was founded on resistance to England. I mean to say: the fact that the origins of England and the UK as modern States is completely bound up with Empire and unfettered, unregulated foreign trade surely must have some relation to what is going on today, to Brexit… ? It’s no coincidence. In Glasgow, the best council houses the Corporation ever built were put up at the end of the 1920s in Riddrie and Knightswood. These are the only Glasgow council houses likely to see their centenary. Similarly, when the NHS was created in 1948, it took over 400 hospitals in Scotland. A majority of these- 218 – were (non profit making) municipal hospitals. By the end of the 20th century, little of this legacy remained. People looked to Scandinavia for inspiration in a way that they had once looked to Scotland. In Glasgow, it is hard to avoid concluding that the rot set in when the Labour Party realized it could take the voters for granted and still get re-elected. A good point well made, Red. England is a country of 53 million people and xenophobic chauvinists represent a small minority. It’s easy to imagine otherwise (especially if you’re not really trying very hard) because the right wing media likes to characterise the entire English working class population as small-minded Cockney patriots who support Man United and love the smell of sizzling bacon but this is no more realistic than imagining all Scotsmen to wear kilts and carry bagpipes. People point to the Brexit referendum result and like to use it as a stick with which to beat the English, and it would be stupid to pretend the result was anything to be proud of either for the English or the Welsh but 48% voted Remain, which represents an awful lot of people. Some voted Leave because the opinion polls made them think they could get away with doing so, some voted Leave for valid reasons concerning democracy and the right for national governments to make their own decisions, and the rest did so for despicable reasons but that’s no reason to tar all English people with the colonial brush. England most definitely does not mirror the USA. What the Americans call “conservative” the English would call “right wing extremist.” The morons in the yellow jackets make a lot of noise but they are a tiny minority, within another minority, who just happen to be gaining a lot of undeserved publicity. Hi Chris – you are certainly right that 48% voted Remain and the cultural/political makeup of any country is complex, not binary, and certainly right that the EDL represent a tiny minority of views. However we are witnessing a resurgence – or new manifestation of English nationalism – that threatens to destabilise the United Kingdowm, bring down the current government and undermine the economy. These are just facts. We can’t really pretend tat this isn’t happening. It hasn’t come out of nowhere. Maybe the English working class are pissed off at being sold down the line by Red Tories and the like and voted Leave as a protest. It is much worse in England with the bedroom tax and prescription charges and tuition fees and benefit sanctions. Maybe the less well off people think that if they are going down they are going to take down as many better off people as they can with Brexit. Who cares about the economy when you don’t have a decent job only slave labour zero hours making money for some pig ignorant baboon? Who really cares if they lose their fat grant from the EU or whatever it is they are greeting over now. These people didn’t give a stuff as they threw 100s of 1000s of vulnerable people into destitution so they can get it right up them, as it were. Of course, some Leavers are going to be raging when the NHS continues to collapse around their ears and they realize all that stuff about Leave being a good option for NHS funding is BS. I bet the Tories/New Labour/right wing of the SNP just use it as an excuse to impose more austerity (if they can). Thanks for replying. I agree there is nothing to be complacent about but I’m old enough to have cut my political teeth in the 1970s when the National Front, for a short time, appeared to be on the point of establishing themselves as a serious threat, and again in the 90s and 2000s when the BNP began to make breakthroughs in local elections. I found those times to be scarier than today because the current extreme right is a disorganised rabble rather than a movement to be taken seriously. I remain convinced that most English people (including some that I dearly love) are just as disgusted with the football hooligans masquerading as working class heroes as we are here in Scotland. Realistically, apart from a few Old Etonians no-one thinks about the Empire any more; it’s a part of history that is either forgotten or considered something to be mildly ashamed of. The only time most English people become particularly Nationalistic is when their football team plays in the World Cup, although even then, apart from among the Sun-reading fraternity, it’s pretty tame compared to the fuss when Ally’s Tartan Army went to Argentina in 1978! Hi Chris – sorry i have to disagree. According to a YouGov poll conducted around the time of the Rhodes Must Fall protests two years ago, 43% of British people believed the British empire was a good thing and only 19% a bad thing, with 25% believing it was neither. Furthermore, 44% felt that Britain’s history of colonialism was something to be proud of and only 19% felt it should be regretted. The views of the NF from the 1970s have no become mainstream. What is the Windrush ‘scandal’ or the Home Office “Go Home” vans organised by Theresa May? What of the hysteria about asylum seekers crossing the Channel? We are living through a time of increased incidents of racist abuse and racist attacks as documented over and over. If Brexit is not an expression of English nationalism, what is your account of it? All fair points, Bella. I’m shocked by that YouGov poll result; it seems I confine my circle of friends to a mere 19%! An alternative account of Brexit would be that it is a protest vote against austerity, the same way that many Yes votes were protest votes against austerity. It has little to do with nationalism, really. But the press love the illiterate small-minded working class nationalist trope or narrative or whatever this year’s buzzword is. So this account of Brexit will be ignored. Just as the Nazi Yessers stereotype was preferred by the mainstream press during indyref. I bet the centre-right Yessers will resurrect that one in the event of indyref2 just to add insult to insult. What you say is making sense to me. We had our backward looking heroic failure years ago. Jacobites. Tories who wanted to go back to the good old days of absolute monarchy. The difference with the Brexiteer reactionaries of today is that they look like succeeding. Great article, and I enjoyed the debate in the comments. Every country and every ideology has its glorious failures, inglorious failures as well. Since this whole Brexit thing started, I’m haunted by the frozen faces of Lord Franklin’s crew. The hubris! The horror! Sending heavy battleships to find the NW Passage, thinking gunboat diplomacy would subdue the Arctic ice. Shooting at the natives who came to offer assistance. And when the whole enterprise foundered, eating each other, and dying of lead poisoning from their tins of corned beef. Poor sods. You can’t blame the English underclass for following the Brexit bus, hot bile beats cold despair. Now, if only there was still an internationalist Labour Movement. We’re looking at the particulars of “Englishness” because we are in the throes of – and beholden to English nationalism. No?